Nowadays, there are more and more travellers booking cooking courses for their holidays to make their experiences more personal and creative. 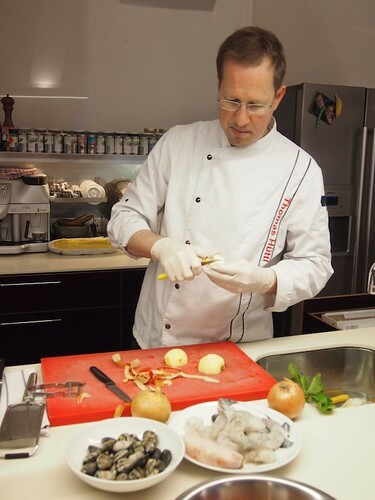 We have recently been offered this chance at the Vienna Kochatelier, a Viennese kitchen owned by the chef Thomas Hüttl. My colleagues during this creative event were the travels writers Elena Paschinger (www.Creativelena.com), Katrina Stovold (www.TourAbsurd.com) as well as Sarah and Terry Lee (www.LiveShareTravel.com). At the famous Viennese market of Naschmarkt, we meet with Thomas to shop the ingredients for our creative menu. He asks us about our cooking skills and whether we have any allergy food. After having some feedback over our cooking knowledge, we bought some cheese, fish, vegetables and fruit for our dessert. Thomas Hüttl´s kitchen is like a dream come true for people who love cooking. His kitchen is equipped with all cooking utensils that you can imagine. Before chopping the vegetables, we get comfortable at the creative course drinking traditional Austrian mulled wine. We begin to prepare a Bouillabaisse, a fish soup that takes a couple of hours until it gets the right flavour mixing the spices. Meanwhile, Thomas shares with us that there are many men who come to learn how to cook! Their wives then wait talking in the dining hall until they are spoilt by their husbands´ dishes. The main course we cook during our creative cuisine are so-called Austrian “Spätzle”, homemade pasta similar to gnocchi but much smaller that are mixed with cheese and onions. The dish is yummy and it is very easy to prepare. Chopping the onions we learn that the knife should be longer in order to use movement instead of power. Using the method properly you can avoid burning your eyes when you cut onions. We finish eating both dishes that are just so delicious. Finally, it is time to make Apple Pie, so we peel the apples and fry them. We spread the dough that can be bought in supermarkets and add chestnuts, caramelised sugar and the apples. We fold the dough into a so-called “Strudel”, which is how the Austrian call this typical, tasty dessert, and finish by painting it with egg yolk. Now, it is ready to be baked. Yummmmmmmy!! Apple Pie is so good. Cooking courses are like an addiction because the food tastes better if it is cooked by you. Finally, have a look at my video with the highlights of this creative kitchen course: Enjoy your meal!